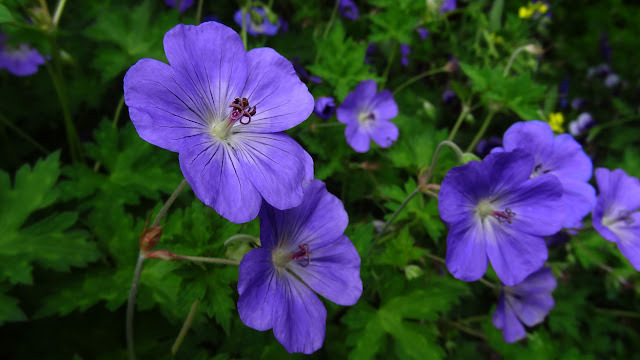 Geranium 'Johnson's Blue' was the first of the brilliant blue geraniums to catch gardeners' eyes. The Royal Horticultural Society gave it the Award of Garden Merit (AGM). The blue of its flowers is hard to photograph and is always more startling when you actually see the plant. The flower stalks can grow quite tall and will droop under the weight of the blossoms. Most gardeners don't bother to stake them, since it is still an attractive plant, even with its floppy habit. The flowers should be cut back after the first bloom, to get sporadic repeat blooms. Often the whole plant can begin to look scraggly and a good shearing is needed to totally rejuvenate it. 'Johnson's Blue' geranium is drought tolerant. It blooms best in full sun, but appreciates some afternoon shade in hot, dry areas. It's very disease resistant and a magnet for bees and butterflies. Please join me for Flora Friday Fotos by linking your flower photos below. We have a flower garden in our backyard and it is a pleasure to see the arrival and departure of the seasons, each bringing with it a bounty of floral gifts. 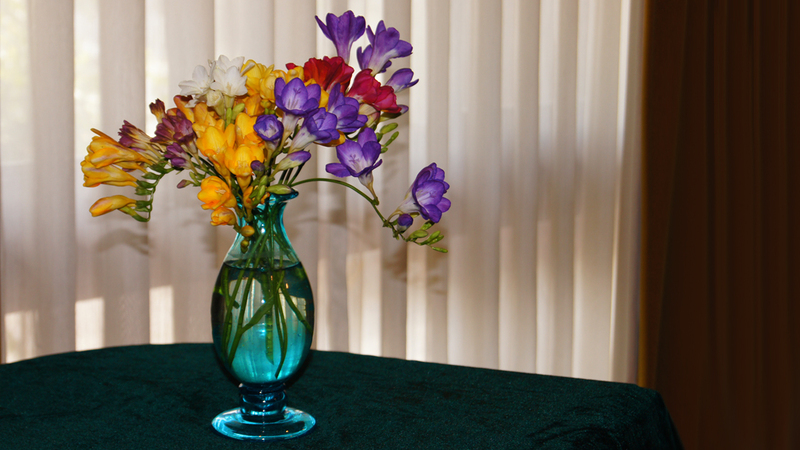 It's always a pleasure to cut some flowers from one's garden and bring them into the house. Freesias are particularly rewarding as they need little care, bloom profusely and many varieties are scented beautifully. Many of the new large-flowered cultivars come in some astounding shades. Join me with your photos of spectacular blossoms every Floral Friday! Lantana is a genus of about 150 species of perennial flowering plants in the verbena family, Verbenaceae. They are native to tropical regions of the Americas and Africa but exist as an introduced species in numerous areas, especially in the Australian-Pacific region. The genus includes both herbaceous plants and shrubs growing to 0.5–2 m (1.6–6.6 ft) tall. Their common names are shrub verbenas or lantanas. The generic name originated in Late Latin, where it refers to the unrelated Viburnum lantana. 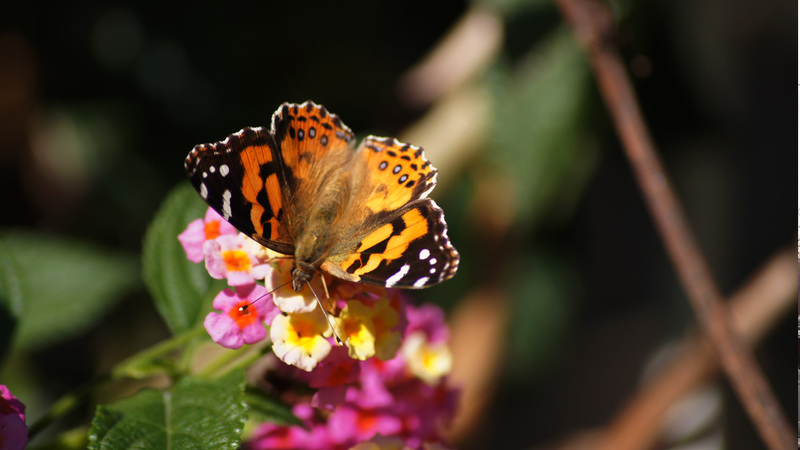 This is a Lantana camara in our garden, which this butterfly is finding particularly tempting. 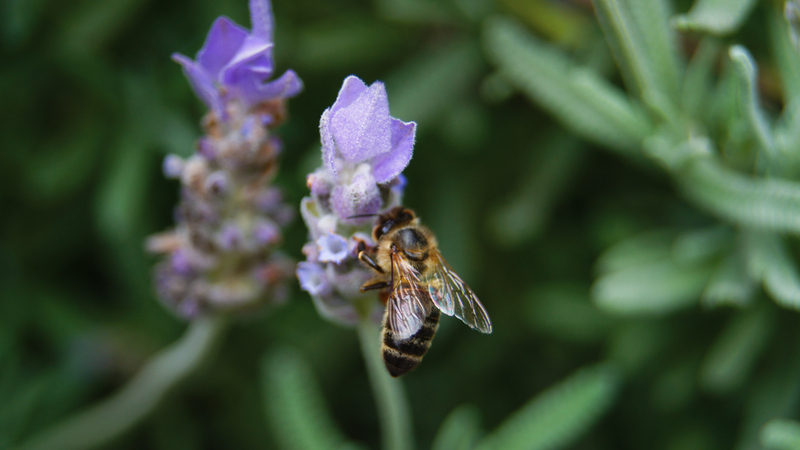 Italian lavender (Lavandula pedunculata) is very attractive to bees and photographing the interaction of bee and flower is always rewarding! Please join us and share your flower photos every Friday!